Rosie and Jim seems older and longer ago than having aired its first episode in 1990. The old fashioned, slow moving barge it is set on harks back to older times. My niece and nephew are the right age to have been big fans. It is the story of two rag dolls who live on a barge with a story teller. I had always thought that John Cunliffe who portrayed the story teller had created the series, he didn't. Cunliffe is creator of Postman Pat so it is an obvious assumption. Cunliffe was in the first two series, Pat Hutchins the next two and Neil Brewer for the final four. 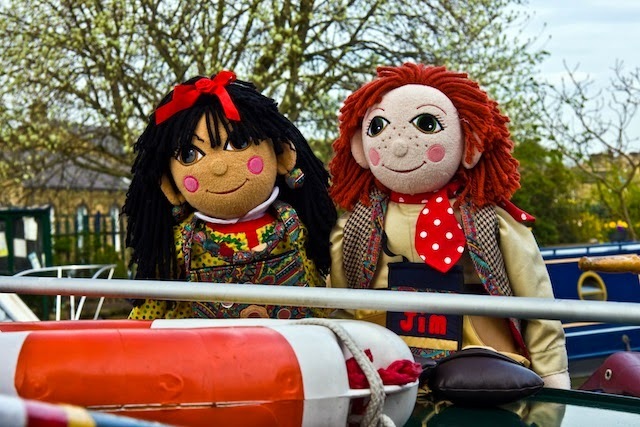 Rosie and Jim was created by puppeteer Robin Stevens and prolific children's tv creator Anne Wood. Wood is also responsible for The Teletubbies, In The Night Garden, The Adventures of Abney and Teal, Pob and several others. Stevens was Jim's puppet master and Rebecca Nagan played Rosie. Nagan has more recently worked on CBeebies' The Furchester Hotel. Rosie and Jim are naughty ragdolls who come to life when the duck atop the barge they live in alerts them to no one being around. They then get up to a bit of mischief before returning to the barge and their inanimate states in the nick of time. The idea of toys coming to life when no one is looking is quite an old one and probably used most famously in the Toy Story films. I always thought Rosie looked slightly sinister but no one else seemed too bothered and the show was an international hit. A total of 175 episodes were made between 1990 and 2000 and broadcast around the world. There were also public appearances and live stage shows featuring the trouble making duo. Rosie and Jim were married shortly after the last season of the show, unfortunately they drifted apart. Old habits die hard and Rosie got up to mischief while Jim wasn't looking. From happier times, here's an episode, there are quite a few full episodes on YouTube.